Senior League Meeting Monday April 22nd @ 9am! To stay up to date with the latest deals for this year check out our online store! View all of our available tee times and book your round today! View all of our membership packages for the season! Check out the online store! Purchase Gift Cards, Memberships and more! Join out e-mail list to receive exclusive offers and benefits! 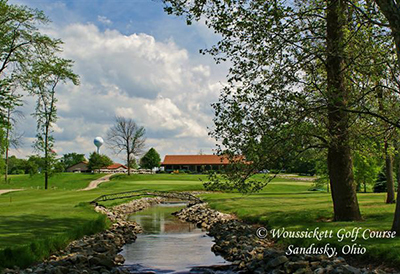 Since it first opened more than 30 years ago, Woussickett Golf Course has earned a reputation as one of the most scenic, picturesque layouts in the Sandusky golf community. As a public course located in Erie county Woussickett is just minutes away from many local tourist attractions. Golfers from throughout the region have come to Sandusky to play this unique 18-hole championship layout, which cuts through a wooded creek basin that comes into play on 10 of the 18 holes. Players will find dramatic dog legs along with open, links-style holes. Our Sandusky golf course challenges players to place tee shots for a tempting risk versus award approach to the pin. It clocks in at about 6,200 yards, creating an inviting course for players to enjoy a picturesque round of Northern Ohio golf. After a day on the course, guests love to relax amid the facility’s comfortable tavern, complete with great food, cold and hot beverages, and beer and liquor. You can choose to sit inside the air conditioned dining space with its panoramic view or step outside in the fresh air on the patio. Woussickett is located a convenient nine minutes from Kalahari, offering daily golf and food specials along with a practice area and driving range. We have hooded golf carts and rental clubs available if you need them. We can’t wait to welcome you to Woussickett Golf Course! Click Here to Join Our Mailing List! You will receive coupons, special offers, and information about upcoming events!